Whale Watching in Okinawa (沖縄ホエールウォッチング) is one of the popular tourism in Okinawa in Winter. From January to March, whales visit Okinawa to raise their babies. The kind of Whale is Humpback Whale that travel from Alaska. They are the largest animal on the earth. You can meet whales over 90% for sure. It takes your breath off. This tour contains the strolling Nagannu Island that has beautiful beach and blue ocean that contains coral sea. Admission: 4200 yen for over Junior High. 3200 yen for elementery school. Free for under 4. Period: January 1 to March 31. Under hard weather condition, it might not be able to travel Nagannu Island. For this reason, there is no refund. If you couldn't see whale, you can get full refund. 1. use local bus 99 or 120 to Tomaritakahashi. 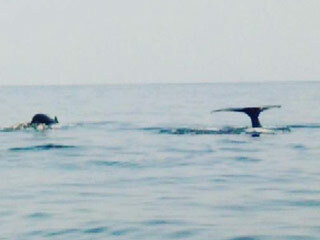 Tokashiki Marine Leisure offers great whale watching and traveling Nagannu Island. The ships name is Happy Island. Whale watching is very popular activities in Okinawa in winter. From January to March, Humpback Whale travel from Alaska to Kerama Islands to raise their babies. Humpback Whale is the largest animal on the earth. This tour also have the strolling Nagannu Island. It is the Atoll Island that made from coral. You can enjoy beautiful white sand beach and blue ocean. Over 90% of chance, you can meet the whales. You get full refund if you cannot meet whales. Under bad weather, under 4 years old kids cannot join this tour for safty reason. 8:30 leaving at Tomari port. 9:00 arriving at Nagannu Island. 9:30 leaving at Nagannu Island and whale watching. 12:30 coming back to Tomari port. Note: DO NOT take any thing out from Nagannu Island. Tour's schedule might change according to the whale and weather condition.